Early in the development of our family, I remember being frustrated by character issues in the kids, or lack of resources I needed to accomplish my job (like the need for more bookshelves or storage containers). One day, Rick encouraged me to write down my frustrations of the day. What I found was that it wasn’t 100 things going wrong, but more like 2 or 3 that kept occurring again and again so that it seemed like 100 things. If it was a physical item that I needed such as a bookcase, we wrote it on a priority list to attend to when we had the time and means to get it. It made me feel better just to have determined the need and see that Rick would attend to it when able. But it was at this time that we thought to actually pinpoint the character needs we saw in our kids at the time, and focus on a solution for them. One of these frustrations I remember recording that day was one of my sons coming inside, hollering for me from one end of the house to the other, making the dog bark, the baby cry, and setting my nerves on edge. When we isolated the problem, we realized he wasn’t trying to do wrong, and we hadn’t taught him to do differently! We used the verse in I Corinthians 14:40 ( Let all things be done decently and in order.) and then made up a chart, guiding him in the correct way to act- walk inside, quietly look for mom and then ask his question. The child was more than willing to comply when it was explained to him what we expected him to do. We then added to our character chart when the kids would do other things that needed further guidance. It changed our focus to learn to look at problems more like projects than to feel overwhelmed by them. I’ve found it a helpful principle to try to step into the shoes of my children and remember what it was like to be a kid. Instead of instantly reacting to our kids we need to stop and consider why they are feeling and responding the way they are. Things are not always what they seem at face value. I would try to give my kids the benefit of the doubt and encourage them to tell me how they were feeling or how they viewed situations. We tend to think everyone thinks like we do, but nothing could be further from the truth. We all see life from our own perspective, and it takes time to train ourselves to step out of our shoes and into the shoes of our children. We need to handle their hearts with compassion and understanding, not just firmness. It only helps a situation to ask questions and not feel like we have to blurt out all the answers before we consider the matter from our child’s point of view. I’m not saying we need to excuse wrongdoing or wrong attitudes, but we need to understand before we are able to deal effectively with it. Our children’s hearts must be handled with care. When we do this, they will then be able to trust us to deal in their best interests and they will respond to our instruction with trust. As you deal with sibling conflicts, encourage each child to communicate with you and each other so you have the benefit of stepping into the shoes of both children involved before you help them to work out a solution. As our children grew older, we found them asking how we arrived at our values, and instead of feeling threatened at their questions we learned to allow them the freedom to ask and used the opportunity to explain how we had arrived at the values we held to. I would notice sometimes after the little kids had gone to bed at night that sometimes one of the older kids would kind of hang around the living room. This became a key to me that they possibly had something on their minds that they needed to talk over with me. Some of the best talks I’ve had with my older kids was late at night when everyone else was asleep and our house was finally quiet. 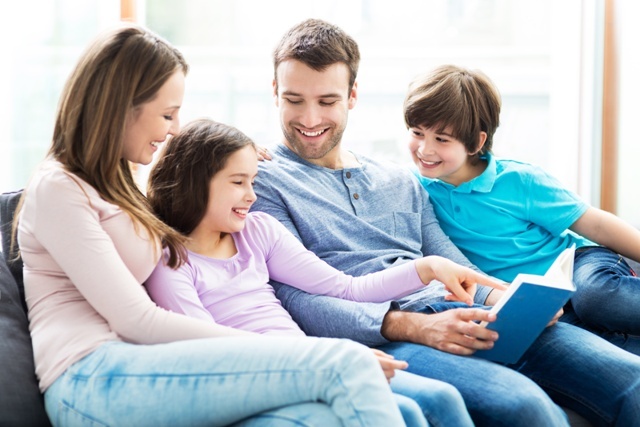 The groundwork you lay when your children are little by trying to step into their shoes and view life from their point of view will make them want to come to you when they are older. They will know they can trust your heart, that you care about them more than you care about yourself. Purpose to be the kind of parent your kids will want to spend time with. Keep the vision before you on tough days when you feel overwhelmed with all the details of life. You are doing what you do to serve the Savior who died that you might live! Your kids are His creation and He has given you the privilege of raising them for Him! What an awesome privilege! 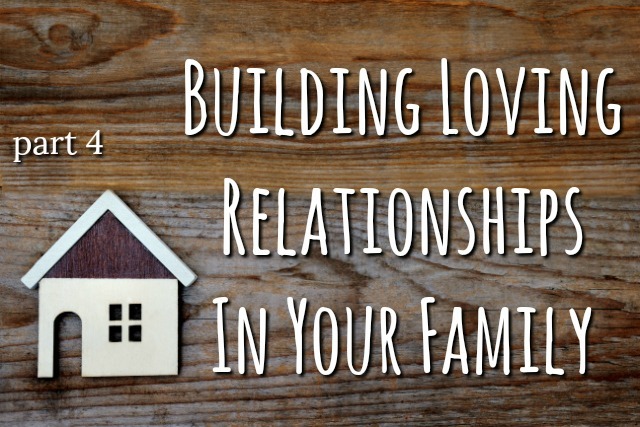 This entry was posted in Building Loving Relationships Within Your Family, Family Relationships, Parenting and tagged character concepts, how to have a happy family, how to make my kids like each other, marilyn boyer, rick boyer, siblings by Marilyn. Bookmark the permalink.